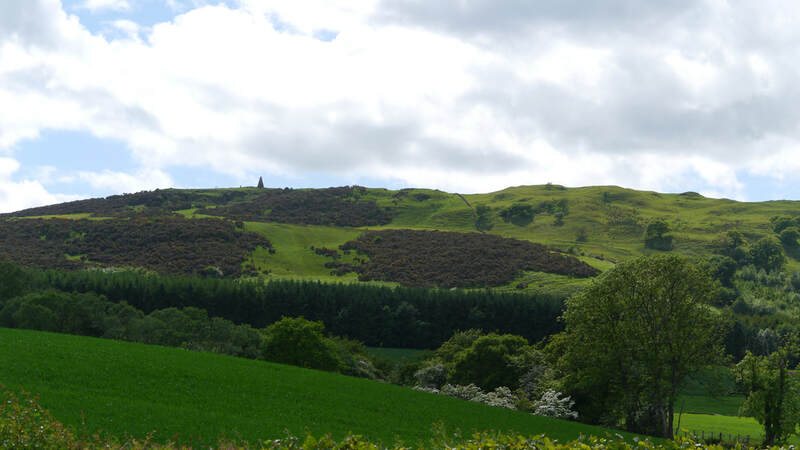 Lochmaben is derived from Gaelic - "maol beinn" - "loch of the bare hill" or "Mabon" after a Brythonic god. 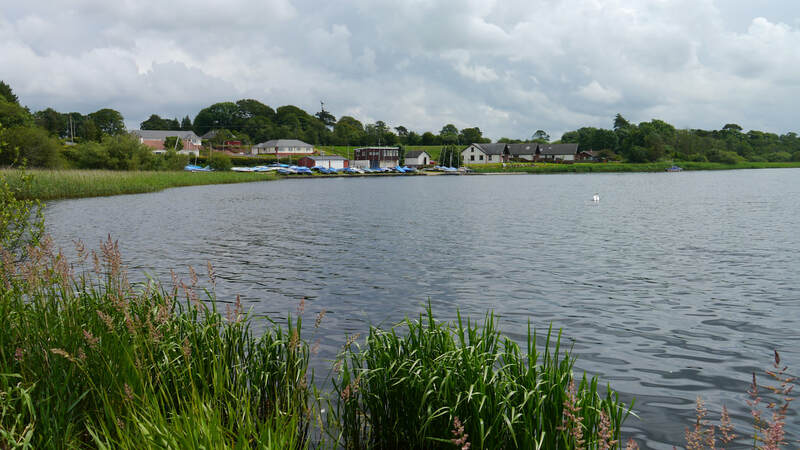 Lochmaben is situated between three main lochs, Castle Loch, Kirk Loch and Mill Loch; a fourth, Halleaths Loch, is shown on early maps; by 1899 it's called Brumel Loch, but by 1905 it has been drained and by 1935 the area is Brumel Wood. A series of other lochs are to be found in marshy ground to the NW of Mill Loch - Upper Loch and the Blind Lochs. A small Grummel Loch is shown on early maps, behind the school; it is now Grummel Park. With the Annan, the Kinnel Water ("a troutful stream") and the Water of Ae ("an impetuous river") on the north and east of the town, Lochmaben is practically surrounded by water. Mill Loch and Castle Loch were the last known habitats in Scotland for Britain's rarest freshwater fish, the Vendace, but they have not been recorded since the 1990s, with Derwent Water in the English Lake DIstrict being their last refuge until recently. A re-introduction into Loch Skeen, in the far north east of Dumfries and Galloway is reported by the Centre for Ecology & Hydrology. Vendace Burn links Kirk Loch to Castle Loch and a property at the Castle Loch end is named as Vendaceburn on large scale maps up to the 1950s. 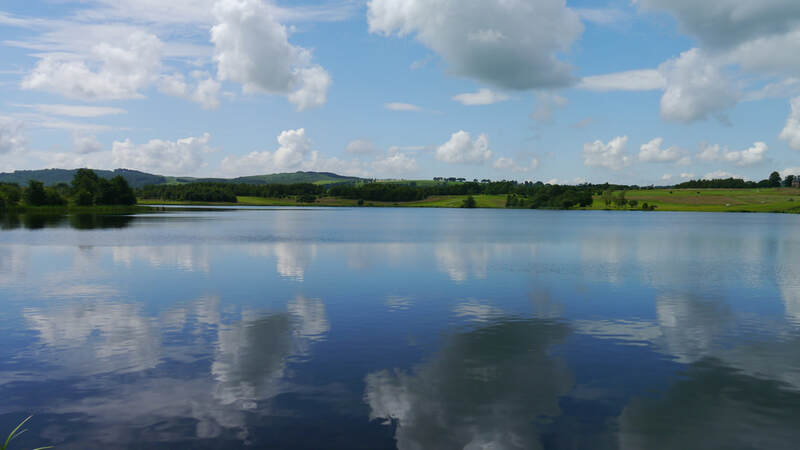 Castle Loch was bought by the Castle Loch Lochmaben Community Trust in 2014, who have been looking after it ever since for the community. Castle Loch has been a Local Nature Reserve since 1962 and is a Site of Special Scientific Interest; a Special Protection Area; and a Ramsar Site (a wetland of international importance). Nothing in Lochmaben. Whisky Shop in Dumfries - TB Watson (aka Drambusters) (8 miles). Nearest distillery - Annandale (14 miles). However - to go along with the gin distillery near Dalton (see below), planning permission has now been given for a rum distillery to be built near Dormont north of Dalton. Ae (Old Norse - "aa" - "water" or "river" or Gaelic "ey" - "river") is the village with the shortest name in the UK; the only one without any consonents in its name; and also one of the youngest - having been built by the Forestry Commisision in 1947 to house workers looking after the recently planted Forest of Ae - at 25,000 acres one of the largest forests in the UK. Maps from before and after the forestation. Ae has an impressive 16ft totem pole, erected in 2006. The ﻿Undiscovered Scotland﻿ page refers to a pub the Forester's Arms, but I've not been able to find anything to suggest that it is stilll open - a facebook page on the Biker's Rest a 2 bedroom self-catering flat above the pub, has a most recent review in 2015. The Forest of Ae has one of the 7stanes mountainbike trails. Amisfield, a village north of Locharbriggs, most notable for Amisfield Tower, a lateish example of a Tower House, but a spectacular one. The Tower, also called Hempisfield Tower (which has led to suggestions that the name is a reference to hemp fields in the area) was the stronghold of the Charteris clan and is generally believed to have been completed in 1600, though some have suggested it is an 18th century folly. Amisfield had a railway station on the Dumfries to Lockerbie line from 1863 to 1952. 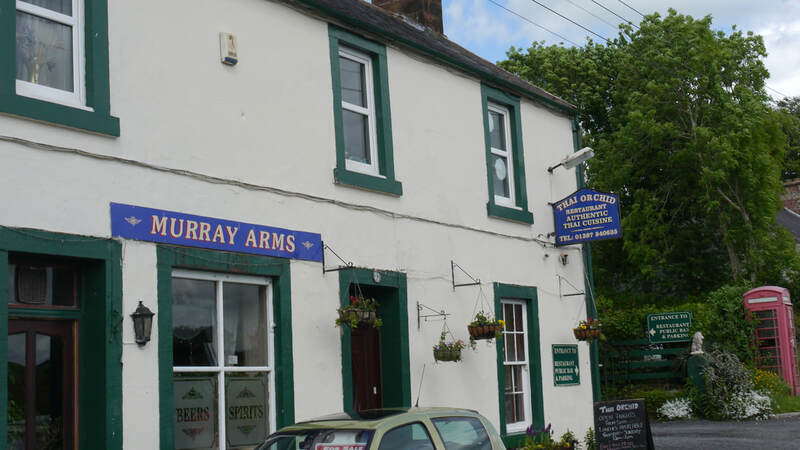 Dalton is a small village about 6 miles from Lockerbie, the village is an unusually rural location for a Thai Restaurant, attached to the village pub the Murray Arms. Dalton Pottery, mentioned on a number of tourist websites closed in 2015 after a fire. A search for Dalton Pottery on the web is likely to send you to Moreton-in-Marsh in Gloucestershire! Dalton does now have a distillery - but it distills gin - on the former Dalton Pottery premises; the bar stocks a full range of other drinks and food is available. Again if you try a google search you might just end up with Dalton Distillery, Georgia (though they do apparently make the world's only sunflower based spirit - Tazaray). Hightae is one of the Royal Four Towns, a status granted by Robert The Bruce to Hightae and the nearby hamlets of Heck, Greenhill and Smallholm. "In each settlement portions of land were entrusted to experienced soldiers, who held them directly from the king and so were known as the King's Kindly Tenants. In addition they had the right to share the common lands and the resources of woods and water. In return, the Kindly Tenants were obliged to provide provisions and garrisons when Lochmaben Castle was occupied by the King or his representatives." Of the four towns, only Hightae remains as a substantial settlement. The Annandale Way passes through the village and thence over Almagill Hill. Mossburn Community Farm is just outside Hightae. 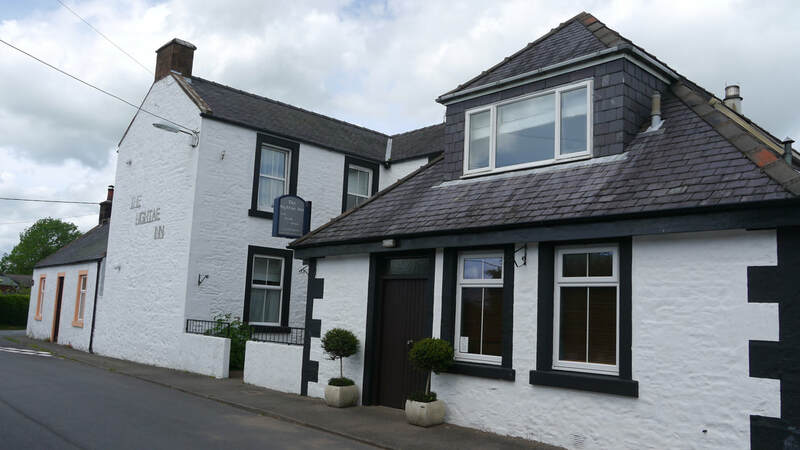 The Hightae Inn Hightae 01387 811711 MW "so many whiskies...so little time"
Templand is a small settlement opposite the confluence of the Ae Water and the Kinnel Water 2 miles north of Lochmaben. Shaw Bridge, which is a listed 19th century structure, crosses the Kinnel Water just to the north of the confluence.The now silent Corncockle Quarry was once used for the building of the Kelvingrove Art Gallery and Museum in Glasgow, and New York brownstones; and as shown on the later of these maps, had a mineral railway connection to the nearby West Coast Main Line for carrying quarried stone. 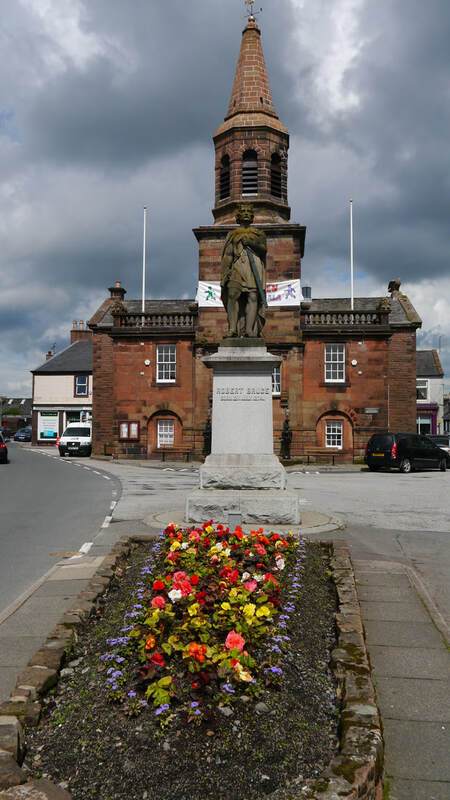 Lochmaben is a village almost surrounded by three lochs, about 3 miles from Lockerbie - the River Annan flows between the two. From 1863 until 1952 the town was connected to Lockerbie and Dumfries by railway - the town had felt it was at a disadvantage without a rail connection, and in the 1850s Lochmaben was still double the size of Lockerbie, so local people promoted a new line. There is virtually nothing left of the Lochmaben Station which was situated at Barras, a detached range of cottages, slightly north of the town near the Mill Loch. 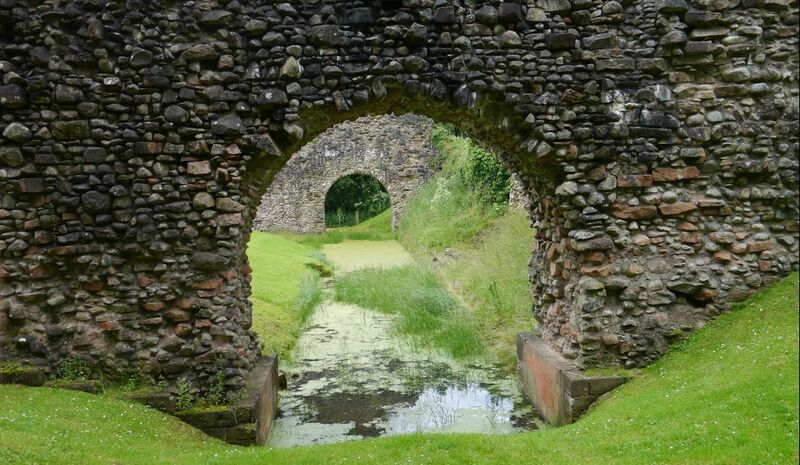 The original Lochmaben Castle was built by the Bruce family, then the Lords of Annandale, in the 1160s. Although it originally had a wooden keep, it is believed this had been replaced by stone by the time the castle was seized by English King Edward I. It was on a motte between Castle and Kirk Lochs, only the motte remains - as part of the local golf course. Edward began construction of a stronger fortification on a site at the South of Castle Loch - probably using stone form the old castle. Robert the Bruce first attacked the new castle in 1299, but did not capture it until 1306, after which it changed hands frequently during the Scottish Wars of Independence - it fell into disuse after the Union of the Crowns in 1603. 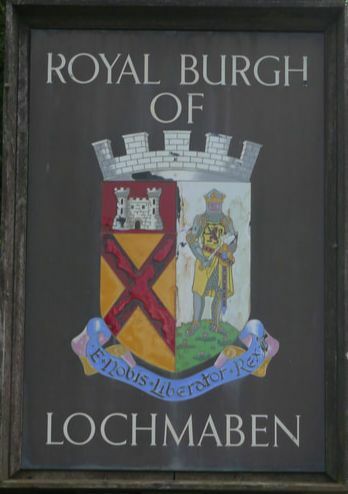 The town's motto "E Nobis Liberator Rex" - "From us is born the liberator king" refers to the claim that Robert The Bruce was born in (the first) Lochmaben Castle, though Turnberry Castle (stronghold of his mother's family, the Earls of Carrick) is where he spent his early life, and is believed to be his more likely birthplace. An interesting 1846 account of the history of Lochmaben is available on the British History Online site. Lochmaben lies between Regional Cycle Route 10 (Dumfries to Beattock via Locharbriggs and Ae) and National Cycle Route 74. Nearest stations: Lockerbie (LOC) (4 miles) rail station has level access to Platform 1 from Station Road, stepped bridge with lifts gives access to Platform 2 with regular trains to Carlisle and less regular trains to Edinburgh and Glasgow. Live train times.